As it turns out, FSBO make less money on their home sales than buyers who work with a real estate agent. According to the report, the median selling price for all FSBO homes was $190,000 last year. 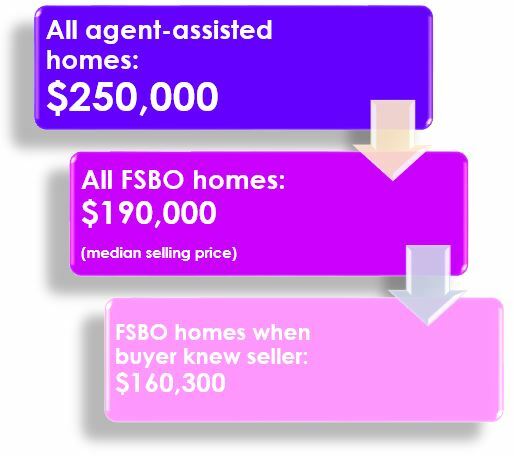 When the buyer knew the seller in FSBO sales, the number plunges to the median selling price of $160,300. For homes sold with the assistance of an agent, the median selling price was $250,000 ̶ that’s $60,000-90,000 more for the typical home sale. According to NAR’s 2017 Member Profile, seventy-five percent of all real estate agents get paid by a percentage commission split between two agents representing the buyer and seller.